The last five paintings I've done have been oils. Today, I thought, "If I don't paint a watercolor, I shall go MAD!" Don't get me wrong, oils are wonderful and you can achieve nice effects with them. Watercolors, though, are magical. Did you know that the great oil portrait painter, John Singer Sargent, painted splendid watercolors when he needed a break from the rigors of his work? They are fresh and masterful and I honestly like them the best of his work. I think he wished he could make his living painting with watercolor. So, needing to do a watercolor, I pulled out a photo I'd taken the other day when I was poking around an old barn. Originally, I'd gone to the farm to take reference photos of the lily pond there. But this also caught my eye. 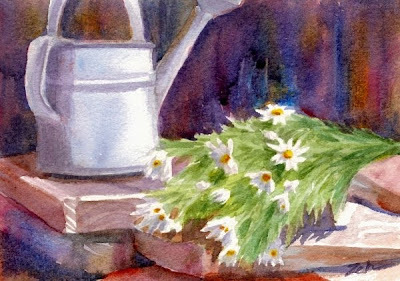 The scene comes to life painted in a spontaneous style with the addition of daisies and bright washes of color in the background.